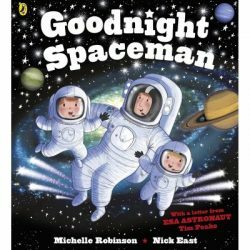 DESCRIPTION FROM THE PUBLISHER: Inspired by ESA astronaut Tim Peake and his sons, and featuring an introduction from Tim, this is the perfect bedtime book! Two space-mad little boys get ready for bed and say goodnight to their toy rockets, launch pads and planet mobiles, before being whisked away into space on an adventure beyond their wildest dreams… Tim Peake is the first official British ESA astronaut. He left Earth on 15th December 2015 to begin a six month long mission aboard the International Space Station. His time in space has been watched by millions and he is inspiring a new generation of explorers, adventurers and questioners.